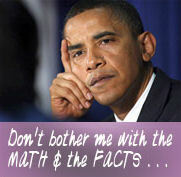 If the mandate is a tax, Obama lied his way into office! 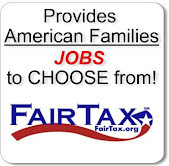 John Kartch, Americans For Tax Reform: Shattered: Obama’s “firm pledge” against “any form of tax increase” on Americans making less than $250k! 2. The Obamacare Medicine Cabinet Tax: This tax took effect in January 2011 and prevents Americans from being able to use their health savings account (HSA),flexible spending account (FSA), or health reimbursement (HRA) pre-tax dollars to purchase non-prescription, over-the-counter medicines (except insulin). 3. The Obamacare Flexible Spending Account Cap – aka “Special Needs Kids Tax”: Starting in January 2013, Obamacare imposes a cap on FSAs of $2500 (now unlimited under federal law). There is one group of FSA owners for whom this new cap will be particularly cruel and onerous: parents of special needs children. There are thousands of families with special needs children in the United States, and many of them use FSAs to pay for special needs education. Tuition rates at one leading school that teaches special needs children in Washington, D.C. (National Child Research Center) can easily exceed $14,000 per year. Under tax rules, FSA dollars can be used to pay for this type of special needs education. 4. The Obamacare "Haircut" to the Medical Itemized Deduction from 7.5% to 10% of AGI: Currently, those facing high medical expenses are allowed a deduction for medical expenses to the extent that those expenses exceed 7.5 percent of adjusted gross income (AGI). Beginning in January 2013, this new Obamacare provision imposes a threshold of 10 percent of AGI. 5. The Obamacare HSA Withdrawal Tax Hike: This provision, which took effect in January 2011, increases the tax on non-medical early withdrawals from an HSA from 10 to 20 percent, disadvantaging them relative to IRAs and other tax-advantaged accounts, which remain at 10 percent. 6. The Obamacare Tax on Indoor Tanning Services: Since July of 2010, Americans using indoor tanning salons face a new 10 percent excise tax. 7. Obamacare Excise Tax on Comprehensive Health Insurance Plans: Starting in 2018, this provision imposes a new 40 percent excise tax on “Cadillac” health insurance plans ($10,200 single/$27,500 family). Higher thresholds exists for early retirees and those in high-risk professions. Tags: ATR, Americans for Tax Reform, Obamacare, Stealth Care, Obama lied, mandate is a tax, taxes To share or post to your site, click on "Post Link". Please mention / link to America's Best Choice. Thanks! American's For Prosperity: President Obama promised that his healthcare law, aka Obama Care now aka Stealth Care, was not a tax increase, but now we know it is actually one of largest tax increases in history. Tell Obama: repeal the healthcare bill and pass patient-centered reform. Check out and sign the new AFP "Hands Off My Healthcare" petition. 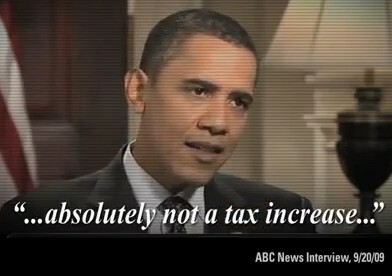 Via ARRA News Service: Added info from other video archives: The following video posted Sept 20, 2009, by Raginglib shows the president says Five Times the Individual Mandate Was Not A Tax. Comment on the video: "I don't know that it matters how cleverly the president sidestepped George Stephanopoulos on this question: People are still going to view it as a tax increase." Tags: AFP, Americans for Prosperity, Obama care, Stealth Care, Government Health Care takeover, SCOTUS, Supreme Court, PResident Obama, its a Tax, taxes, Hands off my Healthcare To share or post to your site, click on "Post Link". Please mention / link to America's Best Choice. Thanks! The Supreme Court’s ruling today shocked most of us. SCOTUS upheld President Obama’s unpopular health care law. The SCOTUS action underscored the need for repealing and replacing the law. We can now call the healthcare bill the Stealth Care. The law was sold to American people on deception. SCOTUS ruled the mandate provision on its own was unconstitutional and then they turned around and decided (5-4) - even though Congress said clearly that the mandate was not a tax and was put in the healthcare bill under the commerce clause, that it didn't matter. They accepted the arguments of the Obama White House that the mandate was really a tax. Thus a deceptive tax disguised as the unconstitutional mandate. In a conference call today with Sen. Ron Johnson (R-WI), the senator seems as stunned as the rest of us over the decision. When the call was set-up, noone expected this decision. Johnson said today, "The Supreme Court rewrote the law not based on a penalty but on a tax." He also identified that the medicade expansion was struck down. The CBO had estimated the cost to the states as $60 - $100 billion to state budgets. Now this cost will be born at the federal level and that in fact we can expect these costs to be underestimated. The government is already fiscally overburdened and this may force us quicker towards bankruptcy. Sarah Palin responded today, "This proves to be such an unsettling time in America as we undergo the fundamental transformation that Barack Obama promised he would do to us if elected. Obamacare was dealt in deception and confusion by flooding the public with an overwhelming amount of conflicting “rationale” via thousands of pages of unread legislative detail, which is the radical left’s M.O. Obama promised the American people this wasn’t a tax and that he’d never raise taxes on anyone making less than $250,000. We now see that this is the largest tax increase in history. It will slam every business owner and every one of the 50% of Americans who currently pay their taxes. The other 50% are being deceived if they think they’re going to get a free ride – because Medicaid is broke. Recipients of Obama’s “free health care” will have fewer choices and less accessibility. Trust me – this much more expensive health care WILL be rationed; to claim otherwise defies all economic and common sense." Recalling President Obama’s famous interview from 2009 with ABC’s George Stephanopoulos where Stephanopoulos asked him over and over again if the individual mandate was a tax. Obama said, “[F]or us to say that you've got to take a responsibility to get health insurance is absolutely not a tax increase.” Stephanopoulos pressed, “But you reject that it's a tax increase?” “I absolutely reject that notion,” Obama replied. Indeed, there are plenty of reminders today why Obamacare was such a bad law in the first place, the question of its constitutionality aside. When the law was first making its way through Congress, Congressional Budget Office reported that at least 75% of individual mandate penalties fall on those making less than $250,000. Since the Supreme Court has declared the mandate a tax, this amounts to a tax hike on middle class families. Both Speaker Boehner and Senate Republican Leader McConnell agree that the only one way to ‘fix’ Obamacare is a full repeal of the bill that clears the way for common-sense, step-by-step reforms that protect Americans’ access to the care they need, from the doctor they choose, at a lower cost. It appears that's precisely what Republicans are committed to doing. 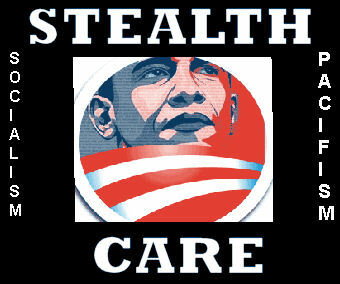 In conclusion: Obama Care can now be called Stealth Care! Today the People Lost - Chief Justice Roberts Saved Stealth Care. Tags: SCOTUS, Supreme Court, Obama Care, Stealth Care, To share or post to your site, click on "Post Link". Please mention / link to America's Best Choice. Thanks! Posted by Bill Smith : Post Link --> 1:25 PM 0 Comments - Share Yours! Bill Smith, Editor: I respect and hold in high regard the following two individuals. 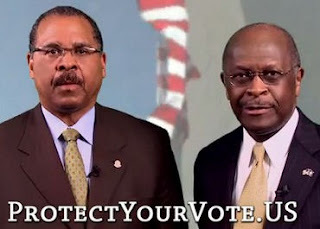 Please listen to this short video presentation in which Herman Cain and Ken Blackwell discuss real threats to Americans' voting rights, and the irresponsibility of Obama Attorney General Eric Holder in refusing to deal with these threats. J. Ken Blackwell formerly served as mayor of Cincinnati, as of State of Ohio, and as Ambassador to the U.N. Human Rights Commission. He also serves on the boards of the Club For Growth, the National Taxpayers Union and is a senior fellow for family empowerment at the Family Research Council. a National Federation of Republican Assemblies board member. He is a contributing author to the ARRA News Service. Tags: Herman Cain, Ken Blackwell, Eric Holder, Dereliction of Duty, Voting rights, Barack Obama Administration. 2012 Election, elections To share or post to your site, click on "Post Link". Please mention / link to America's Best Choice. Thanks! Tell Washington and Bill Nelson that it's time to stop the wasteful spending. Support the AFP Jobs Agenda: AmericansForProsperity.org/jobsagenda. Tags: AFP, AFP-FL, AFPFL, Americans for Prosperity, stop spending, wasteful spending, Bill Nelson, stimulus, jobs agenda To share or post to your site, click on "Post Link". Please mention / link to America's Best Choice. Thanks! Posted by Bill Smith : Post Link --> 10:52 AM 0 Comments - Share Yours! Dr. Bill Smith, Editor: Where would bloggers, politicians, and activist groups be without pollsters? As readers of this site know, I often reference and am indebted to Rasmussen Reports. Therefore, I was more than pleased to be present to listen to Scott Rasmussen as the keynote dinner speaker on June16th at the RightOnline 2012 conference in Las Vegas, NV. I took lots of notes balancing my notepad on my lap and on the round dinner table where several wonderful people were eating, listening, taking notes and sending out tweets. As I was transcribing my notes to write an article, I thought, "dang, I wish someone had made a video of Scott Rasmussen's presentation so that readers could hear for themselves the thoughts of man who makes his living being unbiased and polling the opinions of the American people but who also listens to them, understands them and has a heart's desire for America to live up to the ideals that were meant for it. In his speech he noted that the 80% of the American people still believe in the ideals upon which America was founded and they want an advocate or advocates, not politicians, who will take on the political class running and ruining our country. Fortunately, I learned today that Richard Sincere had made a video of the the speech and posted it to his YouTube account. 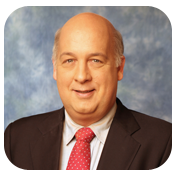 Richard is a conservative reporter whose articles have appeared in the Liberty magazine, the Houston Chronicle, Richmond Times-Dispatch, Wall Street Journal, Washington Examiner, and Washington Times. You can read his interview of Scott Rasmussen in the following article: "Rasmussen Reports founder discusses opinion trends, future of polling methods. Thank you Richard for posting this video. After the video, I have posted some Scott Rasmussen's comments from his speech. Below are comments by Scott Rasmussen in his presentation. He depicted, with words, the shifting dynamics in communication in America, the shift that the people will demand of their government, and the hopes of the American people. Next time you read the Rasmussen Reports, you will now know there is a philosopher and concerned American behind those numbers and words. ~ Whoever wins this year is going to claim a great mandate for their side. . . . that statement will be false. ~ This election is going to be like the trench warfare of WW1. That was the war fought to end all wars . . . all they did was set the stage for a bigger war 20 years later. ~ It will be the communications, the battles and the public opinions shifts that take place after the elections that will determines where America goes. ~ I bet everyone underestimates how the new media is going to change things. You don;t have a clue of how big the changes are coming will be. ~ The New Media is changing America; it is changing everything about our society. ~ In the next 10 years, it will fundamentally change the relationship between the American people and their government. ~ In this world, public opinion drives everything else in the political world. ~ The American people are always ahead of their politicians. The always see the changes coming and what needs to happen first. ~ Public opinion moves first, then there is a catalyst, and only after that do the politicians get involved. ~ The financial industry bailouts remain the most hated piece of legislation in modern American history. . . . That spun off the Tea Party movement and the Occupy movement. ~ There is a sense of frustration, in 2006, 2008, and 2010, the votes did the same thing every election, they voted against the political party in power. It wasn't because they loved republican on e year and democrats the next year, they just wanted to throw out whoever was in charge. Because bluntly they don't think either side has a clue. ~ One of the mistakes we make in politics is that we think everyone is watching the game. That just isn't true. ~ If you want to change the country, you need to reach those people. ~ If you want to reach the people find out what is popular to the people. ~ If you don't find a way to get a better message out, your going to loose them. ~ In this process, the government is not in charge, the government does not run the country. If it is functioning properly, the government plays a nice support role in a self-governing society. ~ Think of government as a "free rider" that is riding along with whatever society does. ~ In 1941, when FDR gave a speech on the radio about WWII, there were 130 billion people in the country, an estimated 90 million listened to the presidents speech. ~ When Jimmy Carter was in the White House and gave his speech, everybody watch because those of us who wanted to watch "Charlie's Angles" had to wait because they wouldn't start the show until he President's speech was done. ~ But then, stations started carrying other things other than the president's speech. 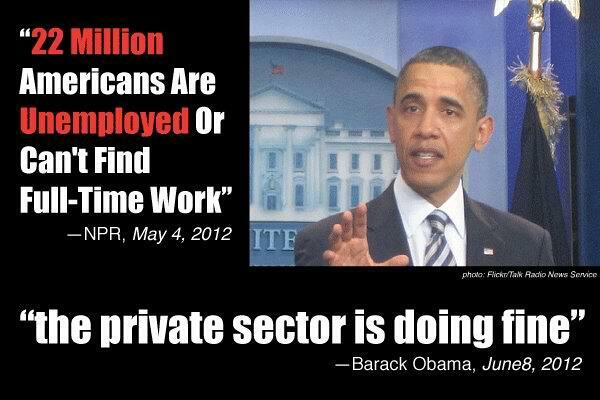 Now when Barack Obama gives a speech, 37 million people tune in. And their mostly partisan Democrats. Same thing thing when George Bush gave a speech - the partisan Republicans listened. ~ That means that it is very difficult to get a central message out the way it used to. ~ How do you get the message out on limited government; let's start with the fact that nobody in America cares about limited government. They care about the kind of society that limited government creates. ~ People are pragmatic. They want to hear about results. . . . So when you begin to push a message out focus on how it impacts life in the real world. And recognize as it gets sent along in all those tweets and different chains of communications to the end user, it will get changed a lot. But the tone of it matters at least as much as the content. ~ With this new media world and people exchanging information like they do, there is simply no way a centralized government can survive like has in the past several decades. ~ The changes we are going to see in the next decade will bring about the first significant spending cuts; I am talking real spending cuts, not reducing the growth of spending at the Federal level; Real spending cuts at the Federal level more than in five decades. ~ Even more than that it will be a a shift in the role of government and that is something that is painful to achieve. Every time you shift power and money from one group to another, the group losing power and money fights back. ~ The Political Class is not going to say that the public thinks we should be spending less and taxing less so we are going to give up our money.It will be an ugly, ugly fight. ~ I am optimistic about America's future, because the American people are ahed of their politicians and I trust the judgement of the American people far more than I trust any elected politician in America. ~ I am also optimist because I believe the American people have a good sense as to what is needed. ~ It going to difficult and some discomfort. ~ 81% of Americans believe that we are endowed with certain inalienable rights including the right to life, liberty, and pursuit of happiness. ~ 77% of Americans believe a free market economy is better than a government managed economy. ~ 6 out 10 believe that when our nation is living up to our ideals we are the last best hope for mankind. ~ Americans believe in the principles and ideals that our country was founded upon. ~ What people need to do is what Dr. Martin Luther King did, America needs to live up to those ideals in good times and bad. We need to promote a message to become what they were supposed to be. ~ When people talk about politics they are not looking for a checklists ... the are looking for an advocate for the American people. . . a person who will take their views and opinions and make the political class surrender. Tags: Scott Rasmussen, speech, RightOnline 2012, pollster, Rasmussen Reports, video, Richard Sincere, communications, news, new media, the future, The American People To share or post to your site, click on "Post Link". Please mention / link to America's Best Choice. Thanks! Tags: Sarah Palin, Right Online, 2012To share or post to your site, click on "Post Link". Please mention / link to America's Best Choice. Thanks! Posted by Bill Smith : Post Link --> 10:44 AM 0 Comments - Share Yours! Please note: Most attending will be be on Twitter and tweeting using hashtag #RO2012. If you can't attend this great event, follow our tweets on Twitter via #RO2012; my tweets are at @arra. 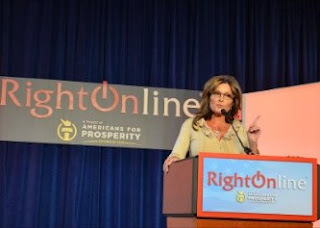 Also, current articles from and about RightOnline 2012 will be posted via the ARRA News Service. Tags: RightOnline, 2012, Las Vegas, speakers, events, ARRA News Service To share or post to your site, click on "Post Link". Please mention / link to America's Best Choice. Thanks! ARRA News Service - Yesterday, Floridians U.S. Representative Sandy Adams, Allan West, Steve Southerland, Jeff Miller, Richard Nugent and Tom Roomy and 80 other Republican Representatives from other states sent a letter to Attorney General Eric Holder regarding the growing threat of “SWAT-ting” and its costly ramifications. "SWAT-ting" is a false emergency call made over an Internet connection to mask the true caller's identity and location with that of an innocent individual. This despicable practice has existed for several years and is a vary dangerous situations / game where people can be seriously injured or killed. Before the recent rash of Swatting calls against conservative bloggers, others have suffered as well. In Dec 2007, a 911 call made from Chicago, IL sent Salinas, CA police to an unsuspecting Salinas home. In 2008, the FBI warned emergency 911 centers that swatters was a growing menace. The DOJ at that time also warned about swatters making false reports to elicit an emergency response by other first responders, adult protective services, to a specific physical address. 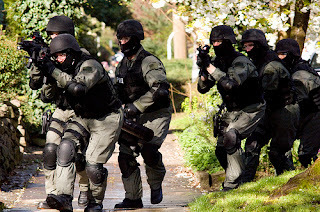 "We write you concerning the growing threat of “SWAT-ting” and its costly ramifications. These crimes occur when individuals call emergency dispatchers under the guise of another person’s name with fraudulent claims, causing local law enforcement to swarm the home of innocent Americans. SWAT-ting first arose in 2002, but as technology and the Internet has expanded, the dangers of SWAT-ting are also on the rise. "Investigators have concluded that the majority of SWAT-ting cases utilize voice over Internet (VOIP) connections between the suspect’s computer and a distant telephone network, and then dialing 911. This enables the suspect to falsify their identifying information, such as their telephone number and address, and make it nearly impossible for emergency dispatchers to identify or track the true origin of the call, or even pin-point calls from VOIP connections. "Some of these calls involve embellished schemes, including armed suspects and hostages, and in some instances, the caller claims that he has just killed someone. Moreover, the caller knowingly uses the identifying information of another person, who is usually an adversary of the caller. This elaborate hoax is all done with the goal of having law enforcement swarm the home of the caller’s foe, which only incites fear in and tarnishes the reputation of an innocent person. "Even worse, SWAT-ting is quickly becoming a scare tactic used against political bloggers, essentially stifling those bloggers’ First Amendment rights. Just last month, a popular blogger in the state of Georgia, Erick Erickson, became the latest victim of SWAT-ting. During the Erickson’s family dinner, sheriff’s deputies were dispatched to Erickson’s home after receiving a 911 call reporting an accidental shooting that appeared to have come from Erickson’s address. Fortunately, Erickson previously alerted police to SWAT-ting tactics; however, numerous similar scenarios have ended with guiltless victims held at gunpoint. "While none of the SWAT-ting victims have incurred physical harm from these hate filled ploys, we are gravely concerned that future victims may not find themselves so lucky. Plus, when law enforcement officers are responding to SWAT-ting claims, resources are diverted from those truly in need--all of this because of differences in political ideology. "Differences of opinion should enrich our lives, not divide us. Each American has the right to freely express his or her ideas and should not be subject to fear tactics like SWAT-ting, which run counter to the liberty that forms the bedrock of our great nation. These crimes are not to be tolerated and necessitate thorough examination at every level. "We urge you to hold true to those promises and work to ensure that criminals using fear in hopes to preventing others from exercising their First Amendment rights are held to the highest standard of the law. To this end, we implore you to thoroughly review each of these cases, determine whether any federal laws have been breached, and prosecute those crimes accordingly." A digital copy of the letter with signatures of the supporting conservative Republican representatives is available online. If your Representative signed the letter, you know your Rep was concerned. If they did not sign the letter, ask them to step forth and oppose swatting formally on their congressional websites. Tags: Floridians, Swatting, SWAT-ting, threat to free speech, terrorist threatening, letter to DOJ, House Republicans, Department of Justice, Eric Holder To share or post to your site, click on "Post Link". Please mention / link to America's Best Choice. Thanks! Posted by Bill Smith : Post Link --> 6:55 PM 0 Comments - Share Yours! Allen West - "Just Getting Started"
Tags: Allen West, Congress, Conservative, Republican, Florida, Treasure Coast, Martin County, Palm Beach County, St. Lucie County, Election 2012, Television Ad To share or post to your site, click on "Post Link". Please mention / link to America's Best Choice. Thanks! Posted by Bill Smith : Post Link --> 8:29 PM 0 Comments - Share Yours! Tags: President Barack Obama, economy, headwinds, the economy, unemployment, jobs, unemployed, blaming headwinds To share or post to your site, click on "Post Link". Please mention / link to America's Best Choice. Thanks! Posted by Bill Smith : Post Link --> 7:57 PM 0 Comments - Share Yours! Tags: Barack Obama, private sector, markets, jobs, unemployment, recession To share or post to your site, click on "Post Link". H/T ARRA News Service. for the article. The former Obama Girl 2008 wised up and is not interested in promoting false hope and change in 2012. So that leaved the worn out Debbie Wasserman Schultz. Wondered for 30 seconds why Valerie Jarrett was not the Obama Girl. Then recalled that Jarrett is the puppet master behind the president. And Wasserman [hyphenated] Shultz is the worn out image of hope and change. Tags: Obama Girl, 2012, Wasserman-Schultz, Obama campaign To share or post to your site, click on "Post Link". Please mention / link to America's Best Choice. Thanks! Posted by Bill Smith : Post Link --> 3:56 PM 4 Comments - Share Yours!